Indoor air quality (IAQ) refers to the quality of the air inside or around your home or office building. Not only is it unpleasant to breathe polluted air, but it can also be dangerous to you, your family, and your employees. Poor indoor air quality can lead to unnecessary health problems. No one wants to suffer with health issues that are avoidable, so if you notice any of these in you or your family, it may be time to have your indoor air quality checked. If your building does not have proper ventilation, the amount of fresh outdoor air being brought indoors is limited. If the air is not moving around, it becomes stagnant and stale. Along the same lines, if you have experienced a significant leak or flood in your building, without the proper ventilation your home or office can remain damp. Dampness indoors can cause mold, mildew, and other unpleasant substances that take a toll on the quality air in your home. The longer you live in your home, the more likely materials such as dust, smoke, animal feces, and other unwanted matters are to build up in your ductwork. This causes the indoor air to become more and more polluted which increases the chance of your family to suffer from health issues. What you do inside your home can significantly contribute to the quality of air you’re breathing every day. If you’re doing construction or remodeling, you can expect dust and other particles to be present in the air. In this case, be sure to monitor and change your air filter throughout your project. Smoking indoors is another major contributor to pollution in the air and negatively affects those who live in your home or work in your office. It is crucial to be aware of what is going on inside your building and to adjust accordingly in order to be sure you’re breathing in the cleanest air possible. If you’ve been experiencing symptoms of poor air quality, it is probably time to take actions towards improving that. Cleaning and improved ventilation are among the most effective ways to reduce indoor air pollution. It is also recommended for your HVAC system to be serviced once a year. Regular maintenance can reduce malfunctions that ultimately contribute to poor air quality. However you decide to tackle it, improving the indoor air quality in your home or office should be a priority for the benefit of you, your family, and your employees. 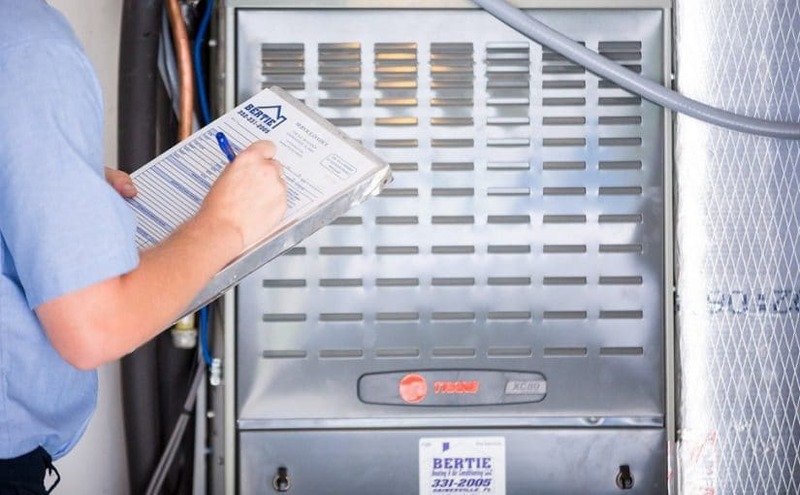 At Bertie Heating & Air Conditioning, we’re dedicated to improving the lives of our customers. We are here to provide duct sealing, ventilation and maintenance services in order to be sure your AC is providing clean, quality air to your home. If you’re in the Gainesville, Florida area including Williston, Keystone Heights, or Palatka, call us today to schedule your AC check up!